Genealogy: Title, Position and Rights in the Scottish Clans and How to Start Your Own Scottish Clan! The Royal Coat of Arms of Scotland since 1603. 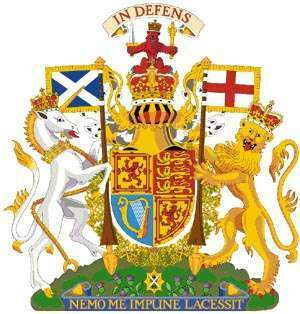 In the picture above you can see the Scottish unicorn and flag, on the right the English lion and flag, which represented the merging of the two royalties. The right to heraldic arms is protected by law for all the descendants of the Scottish clans, including that of the Scottish clan Urquhart. 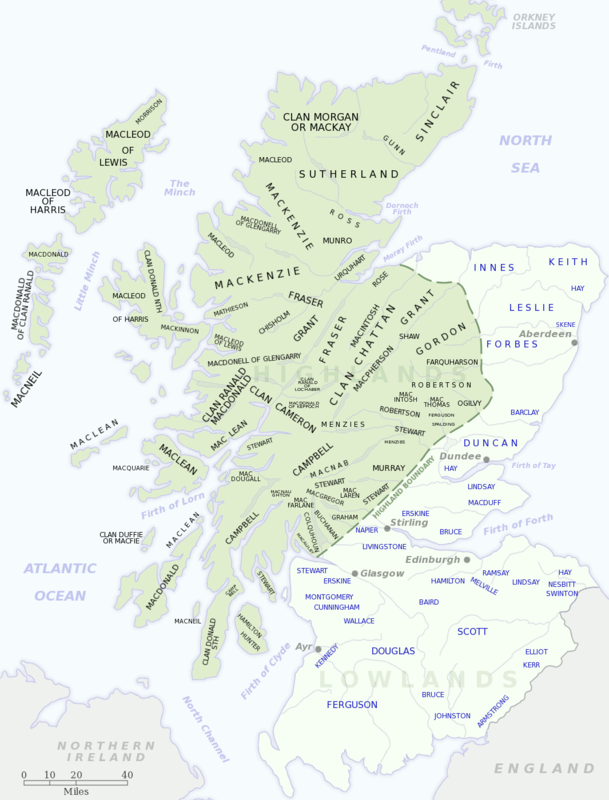 Click on the image above to see a huge map of all the Scottish Clans of Scotland. Both the Scottish Highland and Lowland clans are covered. Not part of a Scottish clan? Then why not petition for your own Scottish Clan? Did you know that most Scottish people and descendants of Scotland, are unable to trace their lineage back more than 300 years, due to the paper and tombstone trail of descendancy running out at that point? Hence starting up your own official Scottish clan may be the only option open to you, particularly if you want to feel that you are part of a Scottish clan and be able to use your own badges, title etc. Most descendants of the old Scottish clans are likely to never be able to prove they are entitled to be included in an existing clan of Scotland - for many, their only recourse may be to make their own clan. I know that some Scottish clans, like the Urquhart clan, are pushing the idea of clan membership through assessment by the male y chromosome genetic markers. Really, this has only limited value and may be subject to improper interpretation. For example, unless the clan lineage had a unique y chromosome genetic marker that just came into existence on the day the founding father of the clan was born, then many people may be considered part of a clan when they are in fact not entitled. Secondly, people who were adopted into a lineage of a Scottish clan at any point in history are legally entitled to be part of the Scottish clan, yet their genes will never show their entitlement to clan membership. Finally, the research into the y chromosome genetic markers has scientifically proven that all males have a y chromosome genetic marker that clearly shows we all share the identical ancestoral father of many thousands of years ago. We are all related by our blood lines! Under Scottish Heraldry starting a clan is pretty straight forward. If you live in the Commonwealth (apparently it now extends beyond the Commonwealth) and you can prove Your family lived in Scotland, born and died there at some time in history, was found to be virtuous and well deserving, then you could petition the Lord Lyon King of Arms in hope for a coat of arms, badge etc. Assuming your petition for arms is granted, your brothers and their families as well as your own children (your surviving first born male of course can carry on your arms, or your daughter if need be) can petition for the same coat of arms but with a mark of difference for each of them. A clan is born. However, the best thing to do I've been told is to trace your family history back as far as you can go, then petition the Lord Lyon King of Arms for a coat of arms etc for the most furthest back male direct relative - in that way, you and all the others of that line belong to the same clan and each of you can petition for your own coat of arms with a mark of difference. The clan chief is then the one that carries the most direct first born male line. There are instances when, if arms are desired, it would be better to apply in your own right, as it may not be possible to successfully trace lineage to an armiger.. 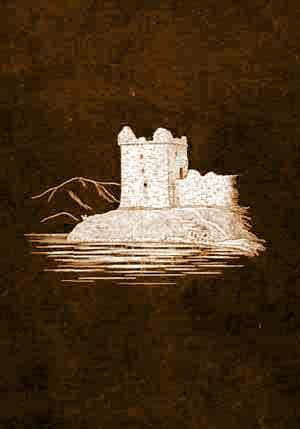 There are apparently families that spend enormous amounts of money to establish a clan and there are instances when, after the money is spent, the searching is done, that there is no obvious clan chief to be found. Also, if you are interested in putting the time and effort into being a clan chief and the title would fall to someone who would not take on the responsibilities, then it would seem reasonable to take the clan chief title for oneself. To clear up any confusion, a clan chieftan is the head of a branch of the clan and comes under the clan chief. Merely having arms does not mean one heads a clan. Further, one seeks arms, one does not establish them on oneself; and certainly doesn't establish a clan in that manner. Scottish Clan tartans can normally be used by anyone, as they are normally not restricted tartans. The exception being one royal tartan that I am aware of. Scottish Crests and badges are subjected to different interpretations of who has the right to wear what and who doesn't. I was told that friends of a clan may wear the buckle of the clan. Apparently, if someone came to the aid of a clan member in some real way, then the clan would then be obligated to do right by that family when they were in need. A badge was a means by which people identified what clan they supported; likewise it warned the observer of the buckle that the clan would protect or avenge the wearer of it. Turns out this was just a case of romantising the past. I have been advised that only clan members and descendants of a person granted a coat of arms, should wear the crest within the buckle - round the waist; the person granted a coat of arms wears the crest within a circlet - round the kneck. On the other hand, a clan tartan can be worn by anyone, but normally only by those who supported that clan. If you think you are related to us, or that I have made a mistake in the heraldry or something, then why not write us and helped make some corrections. A special thank you G.A. Cook of Kingerly, FSSA, FSA Scot, past chairman and fellow of the Society of Scottish Armigers, for some ongoing corrections to this page. To get us to read the email, include "DS" in the subject line.